GUEST BLOG: Journalist Rob McFarland is an accomplished travel writer who divides his time between Sydney, New York, the UK and pretty much everywhere in between. He, and his brother Luke, visited Fraser Island about 12 months ago on a boy’s adventure weekend and their adrenaline-pumping experiences were recently published in The Malaysian Star. It’s not quite James Bond… but it’s still pretty world class! 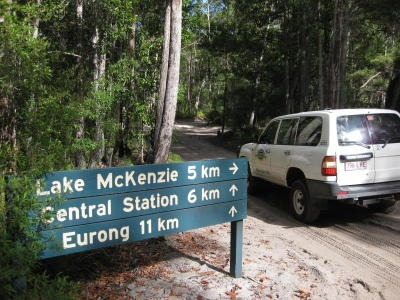 FRASER ISLAND: THIS isn’t quite the James Bond moment I’d imagined. If Daniel Craig had jet-skied from Hervey Bay to Fraser Island, he’d have worn a white tuxedo and been accompanied by a stunning brunette. I, on the other hand, am wearing swimming goggles and am clinging onto my brother. 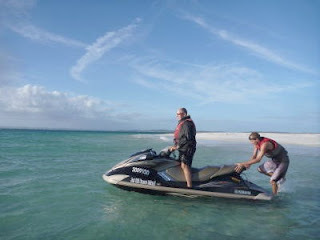 When we met Larry from Aquavue Watersports at 6am, the sea was mirror flat and the sun was just poking over the horizon. Now we’re in the middle of the Great Sandy Strait between the mainland and Fraser Island, the wind has picked up and it’s seriously choppy. Up until I donned my swimming goggles, this meant a rather uncomfortable ride while being relentlessly splashed in the face. Now that I’m suitably attired, it’s some of the best fun I’ve ever had sitting down. I’m on Queensland’s Fraser Coast for an action-packed long weekend with my brother. The aim is to experience as much adrenaline and adventure as we can in three days. Yesterday, we kicked it all off with a stand-up paddle-boarding lesson from Enzo, owner of Enzo’s On The Beach. After wading out into the warm water of the bay, we paddled over clusters of coral looking for fish and other marine life. I was just thinking how well we were doing when I realised we’d been paddling downwind. It turns out that paddling into the wind is another matter. Lie-down paddle-boarding doesn’t have the same glamorous following as its stand-up sibling, but I’d recommend it if you ever have to get back to shore in a strong headwind. Next up was wakeboarding at Susan River Homestead, a 30-minute drive from Hervey Bay. I’d never tried it before but owner Paul “Call me Cookey” Cooke reassured me that he’d “never had someone not get up yet”. Kitted out with helmet and lifejacket, I lay in the water with the board out in front and let the cable pull me along. And blow me if Cookey wasn’t right – I was up the first time. Making the turn at the end of the course to come back took a little longer to master. It ends up taking us two hours to jet-ski to Fraser Island, and there waiting for us is Shayla*, a stunning 10m catamaran that offers sightseeing cruises around the bay. While skipper Brett hoists the sail, we lie in the sun and enjoy a leisurely cruise along Fraser’s coastline. As we pass Duck Island – one of the other islands in the bay – Brett points out ospreys, herons and two rare Beach Stone-curlews bobbing along the beach. They often see dolphins as well as humpback whales during their annual migration. After a swim and some morning tea, it’s time to ramp up the action again. Brett unfurls the boom net from the back of the boat and we all jump in and hang on as we’re dragged through the water. There are only four of us onboard today but Brett reckons he’s had 15 on it in the past. As we pull into the wharf at Kingfisher Bay Resort, I’m reminded of the last time I visited Fraser Island. I was backpacking and eight of us hired a 4WD from the mainland, stocked up on supermarket food and camped on the beach each night. It was good fun, but now being older and wiser, I’m much happier checking into the welcoming arms of the Kingfisher Bay Resort. This low-rise, eco-friendly property has won a bevy of ecotourism awards for its seamless integration with the natural habitat. Boasting four pools, three restaurants and a nightclub, it manages to provide the full resort experience without really feeling like a resort. It also has a sensational on-site spa – after taking a pounding on the jet ski, I’m very content to let therapist Robin ease my aching muscles with a coma-inducing hot-stone massage and facial. After a sensational dinner in Seabelle, Kingfisher’s award-winning restaurant, followed by a sound night’s sleep, we are ready to explore the largest sand island in the world. And while there are several excellent guided tours available, there’s nothing quite like jumping in a 4WD and doing it yourself. All day we bound along winding sandy tracks, weave our way through lush, towering rainforest, swim in crystal-clear lakes and speed along the hard, flat sand of Fraser’s wild eastern beach. Take to the tracks on the world's largest sand island. Ideally, you’d want to spend at least two days here but even though we have only a day, we manage to see the rusted wreck of the Maheno, take in the panoramic views from Indian Head and marvel at the incomparable colour of Lake McKenzie. It’s a privilege to be able to explore this World Heritage-listed icon, and careering around it in a 4WD seems a fitting finale to our action-packed weekend. There are still plenty of adrenaline-charged activities we haven’t got around to trying – microlighting, skydiving and kite surfing to name a few, so we’ll just have to come back. And while my chances of persuading a stunning brunette to accompany me are slim, I can at least pack a white tuxedo. *Shayla Sailing Cruises no longer operate from Kingfisher Bay Resort. The resort has just introduced several new cruising products with Captain Keith and the team from Freedom III. The writer was a guest of Kingfisher Bay Resort and Tourism Queensland.